Winter is finally over! Its been consistently warm the past week, it’s raining a lot, and all of the snow and ice that covered campus is gone. This is evident in Centennial Woods too, because it’s really starting to green up. 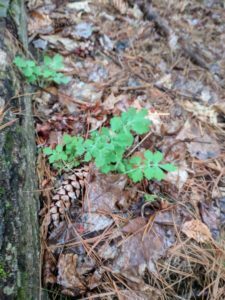 Instead of the forest floor being entirely comprised of dead leaves and pinecones, there’s small green plants starting to grow. The bushes have most of their leaves back and some of the trees do too. Even the trees that dont’t have their leaves back have a lot of buds on them. The ground is very wet though, and I had to walk through quite a bit of mud to get to my spot. My place is a great example of the interaction of nature and culture. At UVM, there is a culture of getting outside and caring for the environment. This was particularly notable in the past few weeks, as it warmed up. Everyone I talked to was saying that they were distracted from doing work by a desire to get outside and enjoy the beautiful weather. While many students were content to spend time in the constructed green spaces on campus, others want to spend time in natural spaces. Since Centennial Woods is the closest natural area to campus, it is a place where UVM students can spend time outdoors. 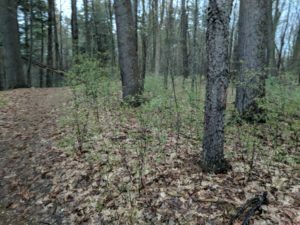 I’ve also seen a lot of people who aren’t UVM students in Centennial Woods, which demonstrates the state of Vermont’s general belief that health is important and that one of the best ways to maintain health is by exercising outdoors. This explains why I see so many people walking their dogs and running in Centennial Woods. I don’t really consider myself a part of my place. While I’m much more familiar with it than I am with any other natural space on campus, I only visit once or twice a month, which doesn’t give me enough time to observe all the changes that are going on. The fact that my spot is in Centennial Woods also contributes to this, because it is a very high traffic area. Multiple people pass by it a week, so while I spend more time in my particular spot, I still feel like I’m just another passerby. But just because I don’t consider myself part of my place doesn’t mean I don’t have a deep connection with it. This whole process has been wonderful, and it has been very cool to physically see the effects of seasonal change. I also find going to my phenology spot helps relieve some stress. It’s very relaxing to be able to get away from everything school, even if it’s just for a few minutes, and my spot is deep enough in the woods that it helps me do just that.